After a hard day’s work, you might toss down your handbag, slip out of your heels and hurl yourself onto the sofa for a well-deserved rest. Believe it or not, your skin deserves the same. It’s just begging to wash off the oils, dirt and other impurities so it can spend the night resting and restoring itself for a new day. How can you help the process? By introducing a dose of vitamin C to your skincare regime. You’re probably already aware of vitamin C’s immune boosting properties, but this miracle vitamin is also extremely effective at limiting the damage of free radicals on your skin.Our skin is exposed to free radicals daily, in the form of sunlight, cigarette smoke and even the air we breathe. These free radicals attack the healthy skin cells until they are no longer able to function normally, leading to aging. We call this ‘oxidative stress’.Fortunately, Vitamin C can neutralise free radicals by fixing the breaks they create in our all-important strands of collagen. The less collagen breaks you have, the less sagging and fine lines you’ll experience. We need collagen to keep our skin looking supple. Free radicals aren’t only responsible for sagging skin and wrinkles. They can also cause skin darkening and age spots. Vitamin C inhibits the body’s production of the enzyme tyrosinase, which prevents excess melanin pigments (responsible for hyper-pigmentation) from occurring. Last but not least, skincare products containing vitamin C are perfect for fighting redness and inflammation, making them ideally for treating both acne and rosacea. 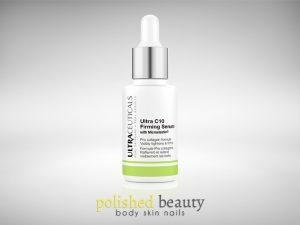 How does the Ultraceuticals Ultra C10+ Firming Serum Work? Winner of the 2015 POPSUGAR Health & Beauty Awards, the Ultraceuticals Ultra C10 Firming Serum harnesses all the benefits of vitamin C along with two powerful peptides (Microelastin & MicroCollagen) to deeply penetrate the skin and tackle the signs of aging. This synthetic, fragrance-free formula supports the skin’s epidermal matrix, offering intense protection against the damaging environmental stressors we face daily, from smog to fried foods. Once protected from free radicals, the body can focus on maintaining and repairing collagen to keep your skin smooth and firm. This age-defying, paraben free product is perfect for sensitive skin due to its gentle ingredients, but is also equally effective for other skin types. Simply apply it to the face and neck in the morning on alternate days before graduating to daily use. Don’t forget to apply SPF30+ when using Ultraceutical treatments. How does the Ultraceuticals Ultra C23 Firming Concentrate Work? The light-weight Ultraceuticals Ultra C23 Firming Concentrate is a powerful anti-aging concentrate that was developed to support the skin’s dermal renewal process and improve overall resilience while offering impressive antioxidant protection from daily free radical damage. The Pro Collagen formula expertly combines 23% pure Vitamin C in a clinically developed system for ascorbic acid, along with Ultraceuticals peptides Microelastin and amino acid Hydroxyproline. Ultra C23 fanatics report almost instantly brighter skin and noticeable wrinkle reduction upon use. This product is non-comedogenic (won’t block your pores) and paraben free, making it a good choice for individuals with sensitive skin. Apply the concentrate to the face and neck on alternate days, building up to daily use as required. Always pair Ultraceutical treatment products with an SPF30+ sunscreen. 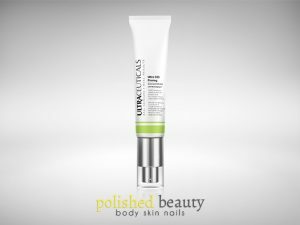 Is the Ultraceuticals Ultra C Firming Range right for me? 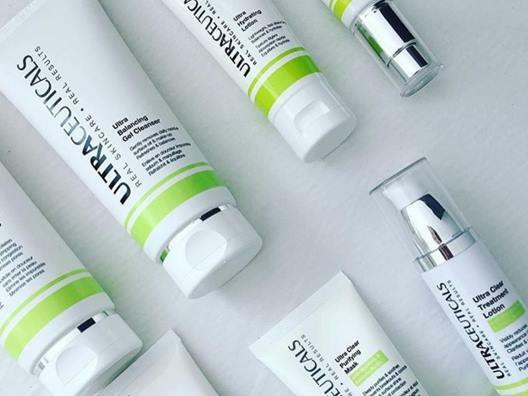 The Ultraceuticals Ultra C Firming range is ideal for women looking to banish dull, tired looking skin and visibly smooth the appearance of fine lines wrinkles. It may also be appropriate for ladies looking to treat rosacea or other forms of inflammation. The product performs well on all skin types, including sensitive skin. In the skincare world, prevention is better than cure. None of us are immune to the damage done by free radicals, making use of the Ultra C Firming range appropriate for just about everyone, whether you’ve got pronounced lines or not. To get a proper overview of your skin condition and receive a more tailored skincare routine, consider investing in a full skin consultation with one of our experienced skincare technicians.